"Sampath Speaking" - the thoughts of an Insurer from Thiruvallikkeni: liquefaction that can sink a Ship !! In materials science, liquefaction is a process that generates a liquid from a solid or a gas or that generates a non-liquid phase which behaves in accordance with fluid dynamics. It occurs both naturally and artificially. Bulk Jupiter, a Bahamas registered cargo ship, sank off the coast of Vietnam in Jan 2015. On 2 January 2015 Bulk Jupiter sank off the coast of Vũng Tàu, Vietnam. She departed from Kuantan, Malaysia on 30 December 2014 with a cargo of 46,400 tons of bauxite and a crew of 19 Filipinos. Its owners were to state - “From the general alarm sounding in the early morning hours of January 2nd, and abandon ship was heard on the intercom, it took only minutes before the vessel had developed a heavy list to starboard. The cook made his way starboard and jumped overboard. The vessel sank shortly thereafter.” The cook, Angelito Rojas, was rescued after 8 – 9 hours and the bodies of two other crew men recovered. Apart from no other bodies or wreckage could be found. Think of a dangerous cargo, and toxic waste or explosives might come to mind. But granular cargoes such as crushed ore and mineral sands are responsible for the loss of numerous ships every year. On average, 10 ‘solid bulk cargo’ carriers have been lost at sea each year for the last decade. Solid bulk cargoes – defined as granular materials loaded directly into a ship’s hold – can suddenly turn from a solid state into a liquid state, a process known as liquefaction. And this can be disastrous for any ship carrying them – and their crew. 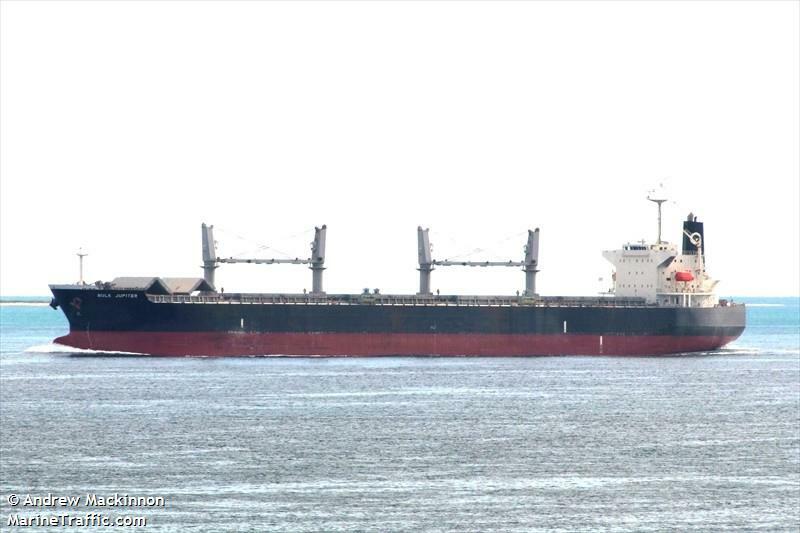 In 2015, the 56,000-tonne bulk carrier Bulk Jupiter rapidly sunk around 300km (187 miles) south-west of Vietnam, with only one of its 19-strong crew surviving. This prompted warnings from the International Maritime Organisation (IMO) about the possible liquefaction of the relatively new solid bulk cargo bauxite (an aluminium ore). A lot is known about the physics of the liquefaction of granular materials from geotechnical and earthquake engineering. The vigorous shaking of the Earth causes pressure in the ground water to increase to such a level that the soil ‘liquefies’. Yet despite our understanding of this phenomenon, and the guidelines in place to prevent it occurring, it is still causing ships to sink and taking their crew with them. Solid bulk cargoes can suddenly turn from a solid state into a liquid state, which can be disastrous for any ship carrying them !! Solid bulk cargoes are typically ‘two-phase’ materials as they contain water between the solid particles. When the particles can touch, the friction between them makes the material act like a solid (even though there is liquid present). But when the water pressure rises, these inter-particle forces reduce and the strength of the material decreases. When the friction is reduced to zero, the material acts like a liquid (even though the solid particles are still present). A solid bulk cargo that is apparently stable on the quayside can liquefy because pressures in the water between the particles build up as it is loaded onto the ship. This is especially likely if, as is common practice, the cargo is loaded with a conveyor belt from the quayside into the hold, which can involve a fall of significant height. The vibration and motion of the ship from the engine and the sea during the voyage can also increase the water pressure and lead to liquefaction of the cargo. When a solid bulk cargo liquefies, it can shift or slosh inside a ship’s hold, making the vessel less stable. A liquefied cargo can shift completely to one side of the hold. If it regains its strength and reverts to a solid state, the cargo will remain in the shifted position, causing the ship to permanently tilt or ‘list’ in the water. The cargo can then liquefy again and shift further, increasing the angle of list. At some point, the angle of list becomes so great that water enters the hull through the hatch covers, or the vessel is no longer stable enough to recover from the rolling motion caused by the waves. Water can also move from within the cargo to its surface as a result of liquefaction and subsequent sloshing of this free water can further impact the vessel’s stability. Unless the sloshing can be stopped, the ship is in danger of sinking. The International Maritime Organisation has codes governing how much moisture is allowed in solid bulk cargo in order to prevent liquefaction. So why does it still happen? The technical answer is that the existing guidance on stowing and shipping solid bulk cargoes is too simplistic. Liquefaction potential depends not just on how much moisture is in a bulk cargo but also other material characteristics, such as the particle size distribution, the ratio of the volume of solid particles to water and the relative density of the cargo, as well as the method of loading and the motions of the vessel during the voyage. The production and transport of new materials, such as bauxite, and increased processing of traditional ores before they are transported, means more cargo is being carried whose material behaviour is not well understood. This increases the risk of cargo liquefaction. Commercial agendas also play a role. For example, pressure to load vessels quickly leads to more hard loading even though it risks raising the water pressure in the cargoes. And pressure to deliver the same tonnage of cargo as was loaded may discourage the crew of the vessel draining cargoes during the voyage. To tackle these problems, the shipping industry needs to better understand the material behaviour of solid bulk cargoes now being transported and prescribe appropriate testing. New technology could help. Sensors in a ship’s hold could monitor the water pressure of the bulk cargo. Or the surface of the cargo could be monitored, for example using lasers, to identify any changes in its position. The challenge is developing a technology that is cheap enough, quick to install and robust enough to survive loading and unloading of the cargo. If these challenges can be overcome, combining data on the water pressure and movement of the cargo with information on the weather and the ship’s movements could produce a real-time warning of whether the cargo was about to liquefy. The crew could then act to prevent the water pressure in the cargo rising too much, for example, by draining water from the cargo holds (to reduce water pressure) or changing course of the vessel to avoid particularly bad weather (to reduce ship motions). Or if that were not possible, they could evacuate the vessel. In this way, this phenomenon of solid bulk cargo liquefaction could be overcome, and fewer ships and crew would be lost at sea. • the cargo has been assessed as not presenting Group A properties. http://www.bbc.com/future/story/20180905-the-cargo-ships-that-liquefy: This article originally appeared on The Conversation, and republished under a Creative Commons licence.